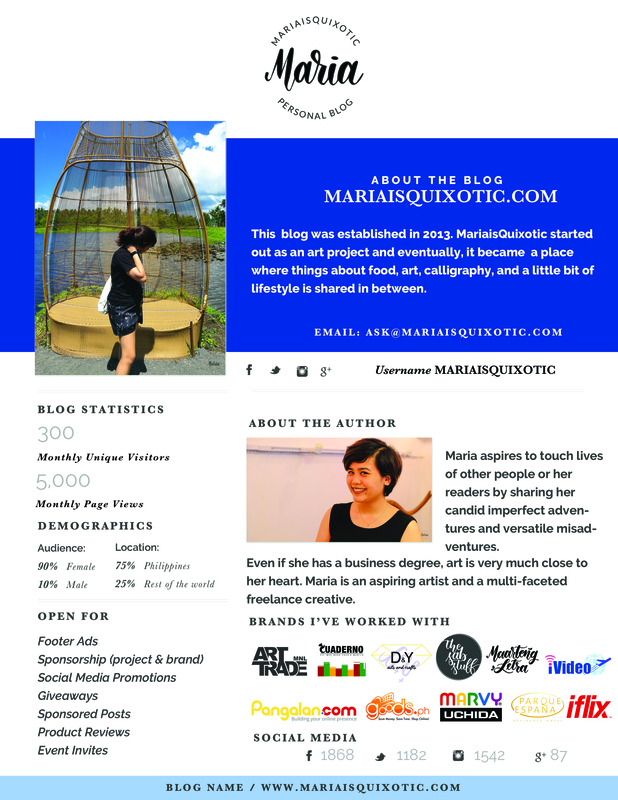 Mariaisquixotic has been in the internet since 2009 but this blog was born on the year 2013. It has been present in events, launches and blog cons. The blog aims to share information and create a closer bond between the reader and the writer. It has posts spanning from lifestyle, arts & crafts (e.g. calligraphy) and her personal life. This blog started in 2013 as a school project and created a way for Maria to eventually pursue writing/blogging. It started as a hobby and/or as a school project but blossomed into a blog whose diversity is quite innate. You may also hire me as a freelance content writer or editor or virtual assistant. If you need someone to write for you, I’m also an aspiring calligrapher. The blog is continuously exploring and growing and hopes to be able to work with you. over a hundred thousand views on Google+. The blog is open for collaborations, advertisements, promotional articles, paid reviews, sponsorships, content placement, link building, and event invites.